“Our gluten-free fans deserve great-tasting, soft and fluffy breads that don’t leave them feeling like they’ve missed out on the good stuff,” said Doug Radi, senior vice president of marketing and sales for Rudi’s Organic Bakery. 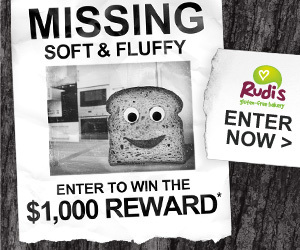 Rudi’s Gluten-Free Bakery® is on a mission to help gluten-free fans find what has been missing most from gluten-free sandwiches—the soft and fluffy texture that makes any bread lover say “yum!” Through a new Missing Soft & Fluffy $1,000 Reward sweepstakes and Lost & Found app on Facebook, Rudi’s Gluten-Free fans can get rewarded for joining in on the search from now until Feb. 8, 2013. 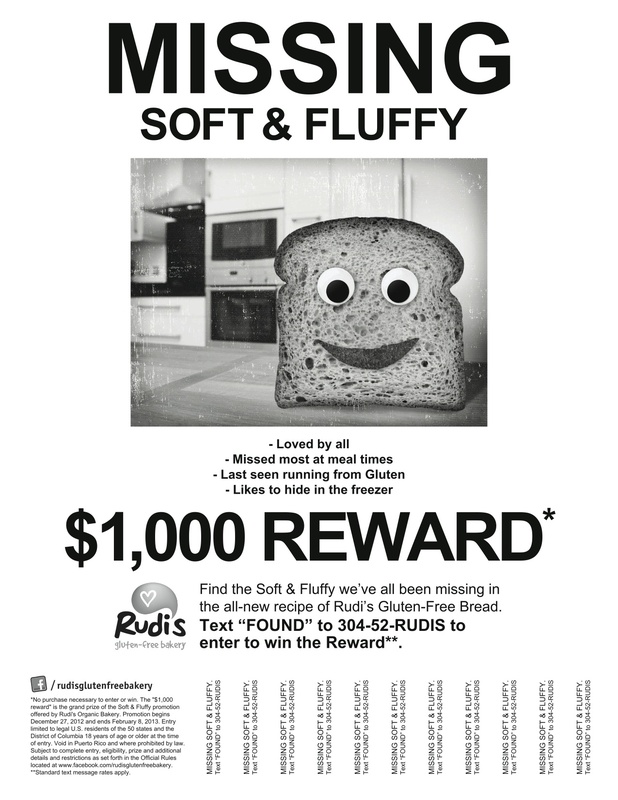 Detectives who stumble across Soft & Fluffy can text “FOUND” to 303-452-RUDIS for a chance to claim the $1,000 reward. To help spread the word, Rudi’s Gluten-Free fans can share Missing Soft & Fluffy notices on their Facebook wall or download a poster to share in their neighborhood. To prove they’re assisting in the search, fans can share photos on the whereabouts of Soft & Fluffy (hiding in the toaster, the freezer, etc.) and as a reward will be entered to win weekly prizes like a Garmin GPS, Nikon CoolPix camera, soft and fluffy bathrobes or a Rudi’s Gluten-Free T-Shirt. Fans will need to post their detective photos each week to be eligible for that week’s prize. No detective goes unnoticed. Rudi’s Gluten-Free will show appreciation by awarding everyone with a $2 off coupon good for the new “Soft and Fluffy” Rudi’s Gluten-Free Bread products. The campaign comes on the heels of Rudi’s Gluten-Free introducing a new softer and fluffier recipe for its Sandwich Breads. Fans can see, taste and feel the difference in the full line of Rudi’s Gluten-Free Bakery Sandwich Breads, including Rudi’s Gluten-Free Original, Multigrain, and Cinnamon Raisin. Always free of artificial chemicals, preservatives and GMOs, the revamped recipe was selected as the favorite bread against a top competitor when it came to flavor, aftertaste, texture, appearance and everyday usability. The new Sandwich Breads are quickly become a fan favorite for their yummy taste, longer shelf life, double the fiber content with 2g per serving, and the presence of the Gluten Free Certification Organization (GFCO) seal. 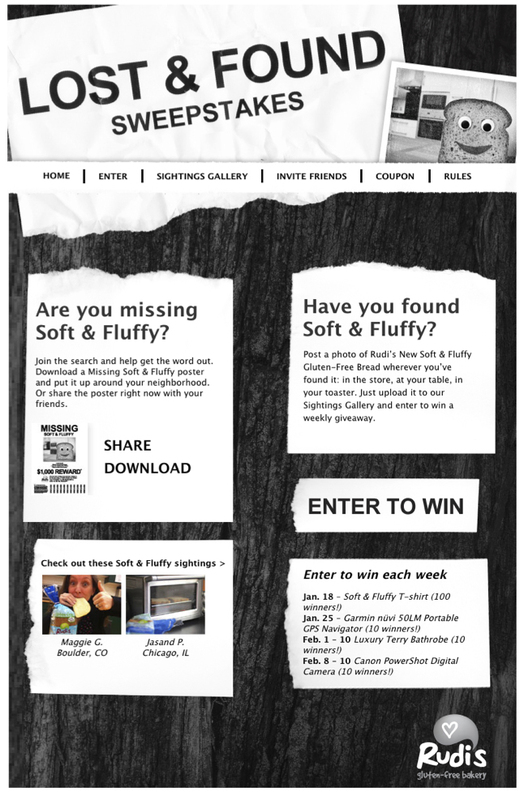 For more information on Soft & Fluffy or Rudi’s Gluten-Free Bakery, visit rudisglutenfree.com. Rudi’s Organic Bakery, Inc., has been passionate about baking better breads for families for more than 30 years. Founded and headquartered in Boulder, Colo., Rudi’s Organic Bakery is the only nationally available brand offering a full line of nutritious and delicious, certified organic breads and baked goods. Rudi’s Organic is committed to baking breads using only the best organic ingredients and no artificial additives, preservatives and GMOs. In 2010, Rudi’s Organic leveraged this heritage to create Rudi’s Gluten-Free Bakery, a line of gluten-free breads and baked goods made with wholesome, all-natural ingredients so that each bite tastes like the real thing. Rudi’s Organic and Rudi’s Gluten-Free products are available nationally at natural foods stores and select mainstream supermarkets. For more information, visit rudisbakery.com.